Trees and Shrubs do a lot for a landscape providing shade, diversity and symmetry to a property but; sometime’s too much of a good thing becomes a liability. Blocking vistas, becoming overgrown and susceptible to pests and disease or distracting from other values of the property or reducing your property’s utility. Trees and Shrubs require constant Maintenance in of themselves but also maintenance of the soil and foundation that ensures they are safe and healthy, but sometimes with all of these factors the best solution is to remove them, even if they are not assessed as Dangerous Trees or Obstructive. We use only the best equipment at The Arbor Barber and we have felled thousands of trees and shrubs safely, beautifying hundreds of homes and helping property owners of residential and commercial businesses and individuals private homes across Langley, B.C, Surrey, B.C, Coquitlam, B.C, New Westminster, B.C and Burnaby, B.C we do all of the necessary work involved and we offer optional full site clean up as well as Stump Grinding, which is a Specialty of ours! We like to also conduct routine Property Inspections and we can notify you of all kinds of solutions for improving the overall beauty of your Landscape! The Arbor Barber has been your local, family owned & operated tree care service for over 13 years and we use only the best professional equipment to assess the best solutions for your property and with our fully qualified and insured staff fell your trees, Grind Your Stumps, Prune Your Greenery and clean your property into the beautiful landscape you always dreamed of! 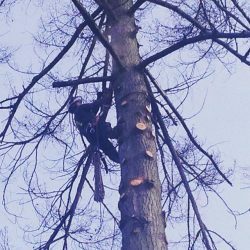 We offer the best Tree Removal and Shrub Removal Service in the lower mainland. Give me a call, your trees will fall for me! Call us anytime for a FREE estimate.